welcome to mind flood mardi! that’s french for tuesday, and english for alliteration. don’t worry! ne t’inquiète pas! it is just like mind flood monday, except it’s on a tuesday, so allons-y! 1. you won’t convince me there’s anything better than a photo of the sam roberts band with a rescue dog . . . unless you can produce a photo of the SRB with TWO rescue dogs. until then, here’s a photo of the guys with napa (the rescued mastiff from israel), and dog tales rescue and sanctuary founders rob scheinberg and danielle eden. the SRB played the luxury animal shelter’s grand opening last month in king city, ontario. 2. is november too soon to plan a spring sam-cation? i hope not, ’cause i actually started in october. the latest batch of just-announced lo-fantasy tour dates includes toronto and vancouver in february, and montreal in march. i could not resist two shows at the commodore in vancouver, mostly because it’s the SRB twice at the commodore in vancouver. 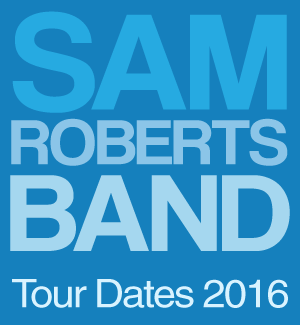 ticket details for all the SRB’s upcoming shows right here. 3. d’ya ever miss a concert, and then you kick yourself making for poor life decisions? the SRB played the legion in tofino, bc in the summer of 2012 (the LEGION! in TOFINO!) that’s a lot of awesome crammed into one sentence. finding this random video of brother down from that night in tofino kinda made my day. 4. the SRB are heading back to minnesota in november for a show at st. paul’s turf club, and that’s the perfect reason to talk about their last trip to minnesota. the current profiled sam and his guitars – the lo-fantasy thurston moore edition jazzmaster and the ubiquitous gibson j45 – back in march, as part of their Guitar Collection series, and it’s probably one of the best things i’ve read about the SRB all year. 5. meanwhile in minnesota, i was so fascinated by sam’s scorecard for the current’s march music madness, it spent most of april as the wallpaper on my laptop. nirvana beat oasis – given sam’s love of brit-pop, that’s kinda mind blowing – and the smiths challenged the beatles for number one. the beatles won, and morrissey is slightly more miserable now. probably. 6. speaking of the beatles, magic on my mind appeared on war child canada’s help! a day in the life CD, but the song is NOT a beatles cover. i know this because the first time i heard it, i automatically i googled every possible variation of this question and i didn’t find any lennon or mccartney. i did find this version from sonic boom records in toronto with eric on the guitar, and that kinda rare gem wins the internet here at the bootleg saint. enjoy! This entry was posted in mindflood monday on November 4, 2014 by annie. hola amigos! bienvenidos a mindflood martes! it’s mind flood monday on a tuesday, because let’s pretend we’re in spain with the sam roberts band. i dunno about you, but i could really use an imaginary european holiday with my bandas favoritas en la planeta right about now. mindflood monday is very real, just like spain’s love for our beloved SRB. hang tight, north america! the SRB and their magníficos conciertos will be back soon. until then, let’s mindflood martes, shall we? 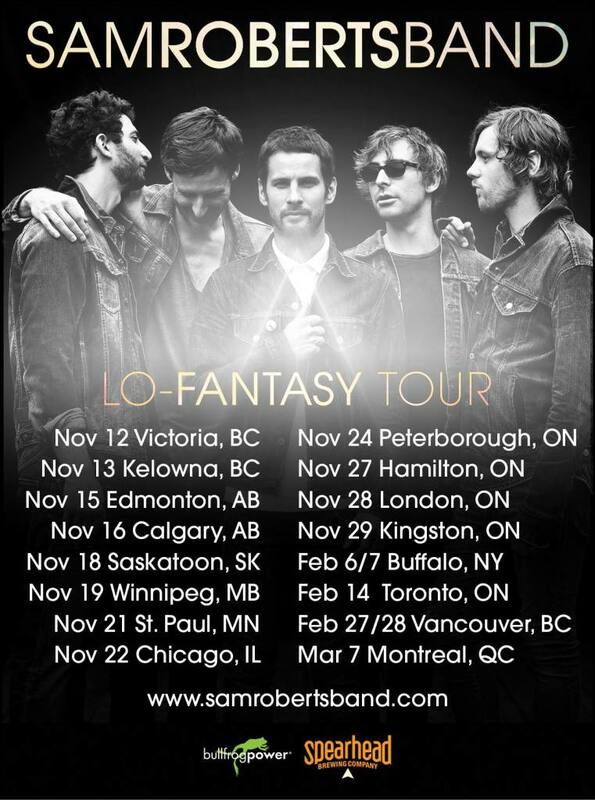 1. confession: i internet with reckless abandon when it comes to the sam roberts band. i will punch my credit card number into anything anywhere if it means i can get something cool and SRB-related, like the SRB’s daytrotter sessions. daytrotter gushes over the SRB, paints pretty pictures of sam, and compares sam to paul mccartney AND bruce springsteen. i love boss comparisons, but macca?! gah. it’s almost too much. before my heart explodes, you need to know there’s two SRB daytrotter sessions – the first is 2009, and it’s them kids, love at the end of the world, a most delightful cover of hawkwind’s hurry on sundown (!!! ), and this version of detroit ’67 . . .
five years later, the SRB made a second trip to the daytrotter studio to record the an all lo-fantasy session, including angola, metal skin, we’re all in this together, and golden hour. if you’d like to listen to these sessions forever and ever, just pay the monthly membership of four bucks, and download them. i dig a lot of the bands daytrotter features, so i keep my daytrotter membership active. here’s golden hour. press play, turn it up, and go grab your visa, ‘kay? 2. speaking of lo-fantasy, let’s turn the clock back to february, because the birth of an album is a beautiful thing! so much promotion! so many livestreams! photos! interviews! even a reddit ask me anything! if you missed the live version of the SRB’s reddit ama in february, no worries – you can scroll all the SRB love right here. 2a. 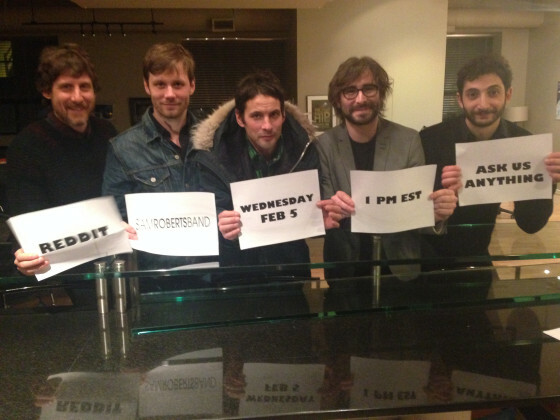 if you wanna pause to quietly reflect upon how great everybody looks in the ama photo, please do – we can wait. take your time. how much do you love those faces, hey? so much. 3. this ottawa citizen interview with sam, published in april 2006, is exceptional. i almost wish we could fast forward to april to throw chemical city a birthday party, but then we’d miss the winter tour, and that’s just crazy talk. 4. the winter tour! the SRB love us so much they’re gonna cross the prairies in november, and that’s one helluva commute, even for one of the hardest working bands in the business. it’s no secret i’m already head over heels in love with both alberta shows, and edmonton’s sonic 102.9 just fuels the fire. beyond keeping the SRB in regular rotation, there’s also commercials reminding me the SRB are coming to town, and snippets of sam and dave’s last sonic session. to keep us going for the next thirty-eight days, here’s minotaur (aka my second bandas favoritas en la planeta) and never enough, from the sonic listener lounge in edmonton. This entry was posted in mindflood monday on October 7, 2014 by annie. brace yourselves – things are about to get real here at the bootleg saint. 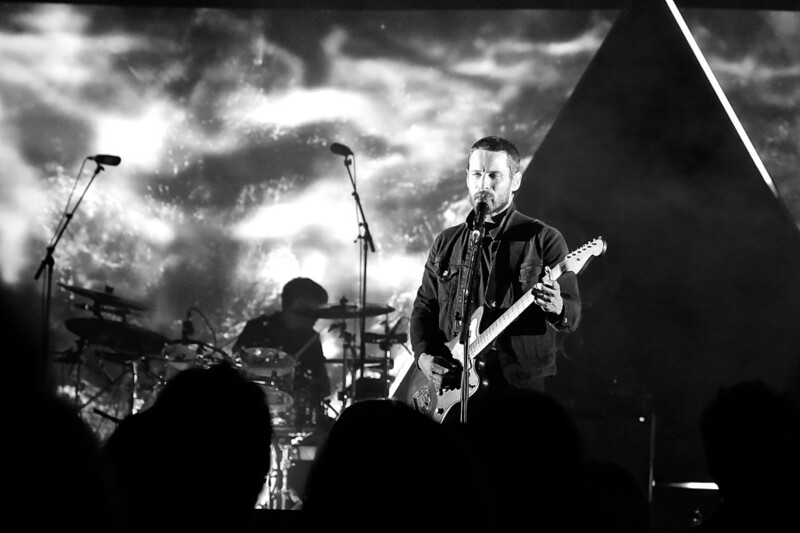 it’s about darn time this blog lived up to its name – or tagline, at least – and curated more sam roberts band content. welcome to mind flood monday! here’s what’s up: on mondays, i’ll post a list of some random SRB goodness i find online. the internet is a big place, and we need to keep track of the good stuff, so let’s do this! 1. t’other day, someone told me they’d never seen the sam roberts band’s audiotree performance, and i was like, whaaat? NO. WAY. cue the appropriate level of freak out, because that’s a travesty. i’ve been freaking out about this for months. the SRB’s audiotree session is so crisp and clear and beautiful, it’s just perfect. stop your life, watch these videos, then go to audiotree’s website and download the sesssion yourself, ’cause perfection can be yours for just six bucks. 2. toro magazine’s 2003 cover story “the believer” is everything. i have two (2) hard copies of the magazine, because what if i wear one out??! first-world problems scare me sometimes. i’m not the only person who loves this issue of toro magazine, ’cause someone painted a portrait of sam on the cover. this photo is from the SRB’s facebook page. 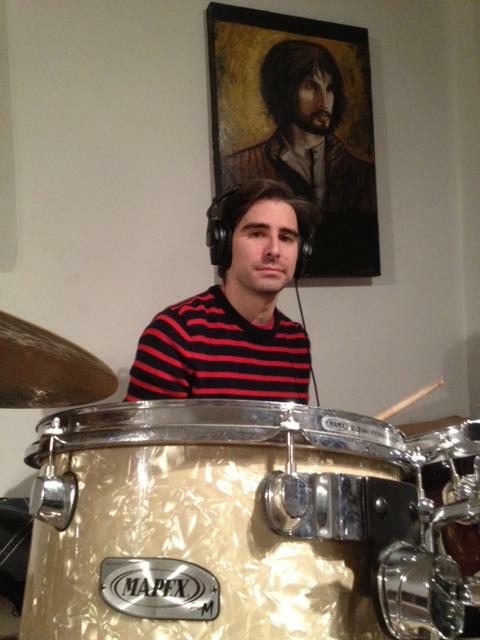 check out the painting above josh’s head . . . how crazy talented is that?! 3. this interview is my raison d’etre. that’s french for “reason why i started this blog.” not this exact interview, but interviews exactly this awesome. published in the west island chronicle, the interviewer is huntley addie, the life guard at the pool where sam took swimming lessons as a kid. sam talks about his childhood, his friends, his family. if interviews came with soundtracks, this one would be every part of me for sure. 4. did you know the SRB play the garage in london, england tomorrow? are you going?! could you? because you should. i really hope you do. please take lots of pictures, and post them all over the internet, because i live for that kinda thing. if there’s a miracle, i’ll be there. if there is not a miracle (things are not looking miraculous right now), this solo-sam acoustic version of let it in, filmed during sam and dave’s trip to london last year, definitely helps soothe the pain. 5. it took me two (2) days of pre-sale fails for edmonton and calgary lo-fantasy tickets. maybe i cried, maybe i didn’t – it’s all a blur of impossible captchas and seats i lost ’cause i couldn’t read those impossible captchas. finally – FINALLY – on the day of regular ol’ general sales, i scored good seats. everybody in edmonton loves the SRB as much as i do, so it’s no surprise everybody wants the best seats in the house for the SRB’s first not-a-festival show in three (long) years. if you think this is crazy, you obviously weren’t at the northern jubilee for the SRB’s collider show. gig city went and and freaked out about it, calling the october 2011 show “one of the most amazing shows of the year,” and i totally agree. from one of the most amazing shows of 2011, here’s taj mahal. This entry was posted in mindflood monday on September 29, 2014 by annie.